It’s one of those feel-good examples of local boys making good and wanting to give back to the community. The Promenade Shopping Centre in Thornhill, Ont. The Serruya family, in partnership with Liberty Development Corporation, has purchased Promenade Shopping Centre in Thornhill, Ont., from Cadillac Fairview for an undisclosed price. Michael, Aaron and Simon Serruya opened their first Yogen Fruz store in Promenade in 1986. Their quick-service frozen yogurt restaurant empire has since grown to encompass more than 1,400 locations in almost 50 countries. “The property has some sentimental attachment and value to us,” said Michael Serruya, a partner in the recently formed Promenade General Partner Inc. business that acquired the shopping centre. “It’s literally a stone’s throw away from where my brothers and I all live. The approximately 900,000-square-foot Promenade sits on more than 50 acres of land north of Toronto at Bathurst and Centre streets near Highway 407 and the soon-to-be-completed Vaughan Metropolitan Subway Station. It opened in 1986 and underwent a $45-million upgrade in 2009 that included the redevelopment of the food court and common areas. Promenade’s more than 150 stores and services include Coach, Aritzia, H&M, Lululemon Athletica, SportChek, Old Navy, Urban Planet and Pandora. Although Promenade is 98.5 per cent leased, Serruya said his group is in discussions to bring in a number of national and international retailers to change the dynamics of the mall. “We’ve got a pretty good sense of what the community is looking for and how the community has evolved over the last 20 or 30 years, and what sort of retailers would really resonate with the community,” he said. “The shopping centre has become more than just a place where people go to shop. The Serruya family spoke to several local developers when it wanted a partner for its acquisition of Promenade. It decided on Liberty, a mixed-use developer and property manager of commercial, office and residential buildings in the Greater Toronto Area. Serruya promised renovations to “modernize some of the areas that may be starting to look a little dated” in Promenade will take place very shortly. 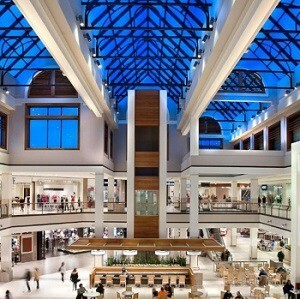 Property management and real estate services company Centrecorp has been retained to manage Promenade. While Promenade is the Serruya family’s first foray into shopping centres, its Serruya Private Equity (SPE) investment arm has a real estate portfolio that includes the 204 Saint Sacrement, The Aldred Building and 8000 Decarie office buildings in Montreal and downtown Toronto’s Templar Hotel. SPE acquired a controlling interest in Kahala Corp. — the franchiser of such brands as Cold Stone Creamery, Blimpie, America’s Taco Shop, Frullati Café & Bakery, Great Steak and Potato Company, Johnnie’s New York Pizzeria, NrGize Lifestyle Café, Ranch One, Rollerz, Samurai Sam’s Teriyaki Grill, Surf City Squeeze and TacoTime — in 2013. The Serruya family made a $15.45-million investment in Emeryville, Calif.,-based Jamba Inc., parent to the Jamba Juice smoothie chain, in 2009. Michael Serruya is also chairman of The ONE Group, which owns several upscale restaurants and lounges. “We certainly love the shopping centre and real estate categories,” Serruya said of other potential acquisitions similar to Promenade. “My family and I have been dedicating more and more of our resources to long-term real estate plays. For now, however, the focus is on Promenade.